Our guest this episode is Jonathan Heckman, founder and writer of the JetCheck.net blog. Jonathan attends Embry-Riddle Aeronautical University where he’s working to a Bachelor of Science degree in Aviation Business Administration. He’s also a student pilot, logging hours in a Diamond Eclipse. David provides his This Week in Aviation history segment, and we have a great report from the Airplane Geeks Australia Desk. Follow the @AirplaneGeeks on Twitter, send us email at thegeeks@airplanegeeks.com, or leave a message on our listener line: (361) GEEKS01. We’re also on Facebook. This entry was posted in Episodes and tagged Biofuel, DOT, EADS, engines, F-18, KC-45, O'Hare, seats, Spirit Airlines, Tanker, tarmac, UAV, United Airlines, US Airways on April 27, 2010 by maxflight. reference to your item in episode 92 I think Rolls Royce would have trouble getting into bed with a other US company due to the effect it had on the company the last time they got involved extensively with one even if it was almost 34 years ago The RB11 engine for Lockheed’s tristar almost bankrupted the company. Only the government of the day putting public money into the company saved it from going to the wall. Thanks for the comments, William. Rolls Royce and Pratt & Whitney now work together via International Aero Engines (IAE) to supply the V2500 series of engines. These essentially compete with the CFM-56 engine. The open issue is what will IAE do for a next generation engine: go with Pratt’s geared turbofan, go with some RR concept, or do nothing? Airbus has said they want the GTF engine through IAE and AviationWeek reports that Airbus is trying to broker an agreement between the two engine manufacturers to make that happen. Hi guys, i just finished listening to your podcast and it was another great one. I just have couple comments. While i was listening, i heard about Charles Lindbergh, i decided to do a quick wikipedia search on him and found out that he once lived right here in my town of Darien CT.
Second, I decided to place my own bid on the tanker contract and submited a modified Antonov 225, thought since the Russians weren’t quick enough to submit a bid, I’d do it for them. Now in all seriousness, if politics had nothing to do with this tanker bid, which aircraft would you choose? 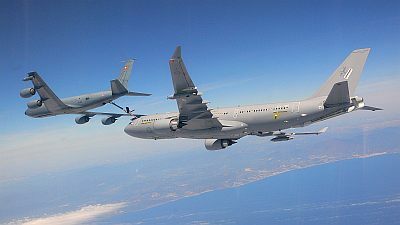 I personally would choose the A330MRTT, it has a longer range, higher fuel compacity, and it can carry a lot more cargo. It’s the perfect tanker. Thanks again, and keep the shows coming. As you can read in here the airlines had to provide hotel, and meals, and etc, but they dont had to pay conpemsation fro the delay. Most Big airlines tried to find lodgment for the passangers, but some times was impossible as the hoteles where fully booked and the had to sleep on the airport. The aproach of Ryanair as far as I know have been different. They didn’t provide food or lodgment during the incident but now they announced that they will pay the compensation to the people that present their bills. Im sure it will cost much less than for the rest of the airlines as Lufthansa or Air France, and they can also pay in some months with more cash on their accounts. Thanks for the comments Diego! We’re happy to have you and Marco as listeners. And good luck with your new podcast at http://www.aeropodcast.com. It’s always good to have more aviation podcasts. I’ll be sure to add you to the podcast page on Thirty Thousand Feet soon. Just finished listening to the latest podcast which was enjoyable except for the comments on light sport aircraft (flying is Australia). You really need to get your information correct. Not all LSA have the Rotax engine (high revs), a lot use standard 4/6 cylinder opposed engines and are just as smooth running as the standard Continental or Lycoming engines. Also the Rotax is a smooth engine and has no more vibrations than other engines. You need to spend more time on general aviation rather than opining on airlines. As you know, we cover aviation very broadly on the podcast. Most others focus the scope of their shows on a certain aspect of aviation. Also, almost any advice you see on defining the content for blogs, podcasts, websites, etc. will tell you to narrow it down. The Airplane Geeks runs counter to that conventional wisdom, and for a reason. But there is a risk in doing that, and you’ve pointed out an example. So we’ll keep striving for accuracy and professionalism (with a bit of entertainment mixed in) and we’ll also count on listeners like you to keep us on the path. Thanks again for the comments, Ron! Here’s a detailed account of a NASA DC-8 research plane that inadvertently flew through a volcanic ash cloud a few years ago: http://www.avweb.com/pdf/volcanic_ash_cloud_encounter_nasa_grindle.pdf. It didn’t result in an incident / accident, but sure damaged the engines.